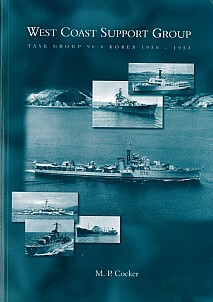 This illustrated portfolio is produced upon the 50th anniversary of cessation of hostilities and as a remembrance of the ships of Task Group 96.8. Through extensive research the author has gleaned information about the multi-national force, including numerous photographs. Ships of the Royal Navy, Royal Australian Navy, Royal Canadian Navy, Royal New Zealand Navy, Royal Netherlands Navy, Royal Thai Navy and the Republic of Colombia Navy all served in the West Coast Support Group known as Task Group 96.8 with the authority and resolution of the Security Council of the United Nations. That so many nations rallied to the cause was proof of the worth of that newly-formed organisation. Britain and the older nations of the Commonwealth rapidly legislated for their reserves to be mobilised, and so largely from Europe and the West came those who would assist the USA to liberate the Republic of South Korea from the aggression of its northern neighbour. Many ships had fought in World War II with the most recent combatant being HMS Amethyst, whose ship's company, and also that of HMSs London and Concord, suffered fatalities and wounds. This profusely illustrated book will be of great significance to those interested in modern history and maritime warfare. There is a great deal of historical detail which is complemented by many photographs of the fighting ships and auxiliary vessels involved in the conflict.